The 1941 October Revolution Parade of November 7, 1941 honored the anniversary of Lenin's 1917 uprising against Russia's provisional government. However, the march itself took on its own significance, as it took place during the Battle of Moscow and presaged the Red Army's ability to turn the tide of the Second World War against the Third Reich. The march in honor of the anniversary of the historic military parade on November 7, 1941 will begin on Red Square in Moscow at 10.00 a.m.
On this day, about 5,000 people will be marching. 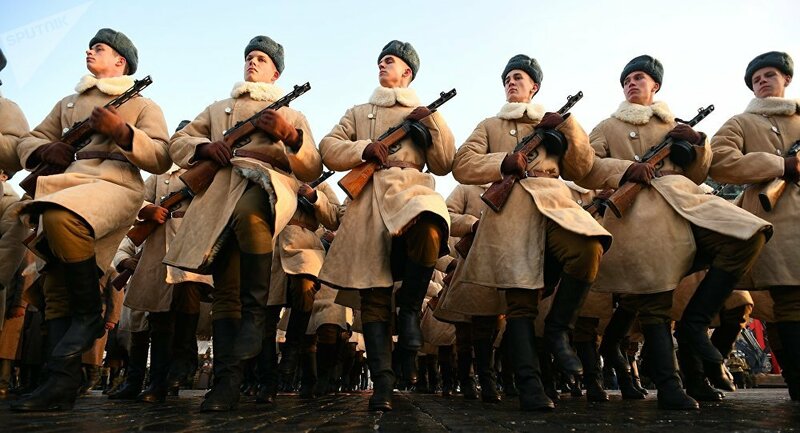 Historical reconstructions will remind guests of the events of the war, and of the stamina, dedication and courageous feats of the Soviet soldiers. As the Moscow authorities note, the military parade on November 7, 1941 represented the Soviet Union's first ideological victory over Nazi Germany. Despite the ever-present threat of aerial bombardment by Hitler's Luftwaffe, about 28,500 people participated in the 1941 parade.